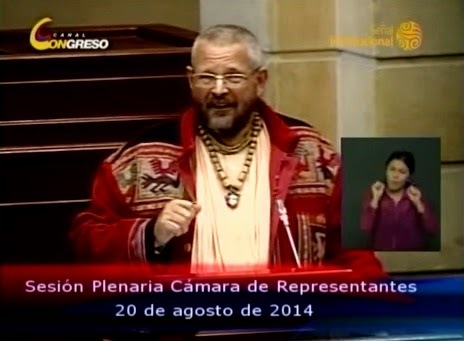 www.youtube.com - Days ago, on August 20, the Vaishnava spiritual master, Srila Bhakti Aloka Paramadvaiti, direct disciple of Srila A.C. Bhaktivedanta Swami Prabhupada, spoke at the plenary of the House of Representatives of Republic Congress in Colombia. He asked the representatives of the Colombian people, to promote peace in a constructive way. He spoke about the importance of being a ruler or legislator; and reminded them, that traditionally, according to Vedic wisdom, the king was the representative of God, and he had to account for their actions towards the people; the King must took upon himself 25% of the reactions of sins that were committed by people under his reign; and today this 25% is distributed among the elected members, as they are responsible for their country can obtain peace, love, health and safety. “On one hand, as regards your responsibilities you are God’s representatives, but on the other hand, this also means a big commitment,” said Paramadvaiti. “The solution is not that there should not be progress; but these solutions need not be through more factories and industrialization, but in having an education which allows you to know and feel happier with less. Global competition wants the mines of gold and also cut down all the trees of Chocó and the Amazon to put other things there; but that is not for the welfare of Colombians, the indigenous groups or those beautiful children of yours, who will be the future of Colombia and the world. In his annual tour visiting different countries in Asia, Europe and the Americas, the Vaishnava spiritual master Srila B. 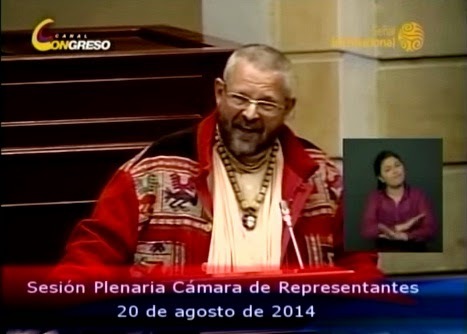 A. Paramadvaiti Swami, founder of the “Vrinda Family”, spoke in the House of Representatives of the Republic of Colombia and delivered his message of protecting the planet by building a sustainable society that respects nature. His call to be more aware of the great damage which is being done to the planet was broadcast live across the country by the national chain of Colombia. Paramadvaiti Swami spoke to lawmakers about "Permaculture", the revolutionary new way to cultivate which is basically done by creating food forests which function as a natural ecosystem that regulates itself. This new form of agriculture could eliminate hunger across the globe at the expense of the mafia responsible for the shameful and corrupt food industry. Paramadvaiti said: “Today, the farming system is called “monoculture”, there are giant fields where one product is grown and there is a single owner; and all the families have no place to cultivate. Permaculture should be supported by you gentlemen, thus in this way we will have a healthy society and a true health; health is not in hospitals but in good nutrition, health is to allow people to grow back all their stuff and naturally respect the rights of others.” In conclusion, Paramadaviti Swami asked the legislators to reflect about their responsibility as Colombian Congressmen: “I ask you, in the name of the infinite God, to take this responsibility and save the national resources of Colombia from the international interests of the multinationals; who are interested in Colombia’s gold, but not in Colombia’s water. As I learned in Tolima, we want water, not gold; because with water we live, but gold is taken by others and we will never see it. And the only thing that remains with us is a wasteland, a devastated land, with undrinkable waters.” At the end, Srila Paramadvaiti thanked for being allowed to speak in the Congress, and did it on behalf of “our Infinite Well-wisher and Mother Nature, who is so great, so kind that she has given us this Colombia, which is the most amazing multi-diversity you can see so far, and hopefully it stays that way.” (Editor's note).